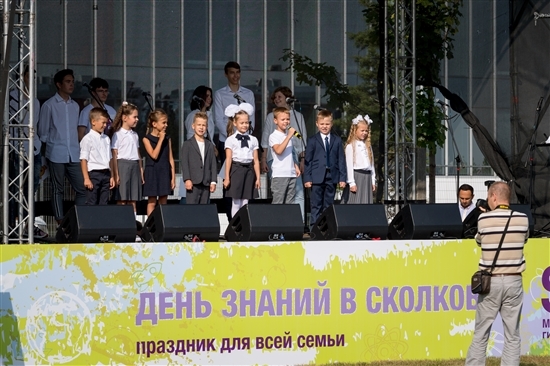 One year after it moved into its state-of-the-art premises inside the Skolkovo innovation city, the Skolkovo International Gymnasium welcomed returning students for the start of the new school year on September 1, along with 222 new pupils. The growing three-year-old school is continuing its tradition of more or less doubling its student body with each new year. Gymnasium director Oksana Demianenko found time amid preparations for the new term to sit down with Sk.ru and share the international school’s plans for the coming year and the constantly evolving concept of the fledgling gymnasium. 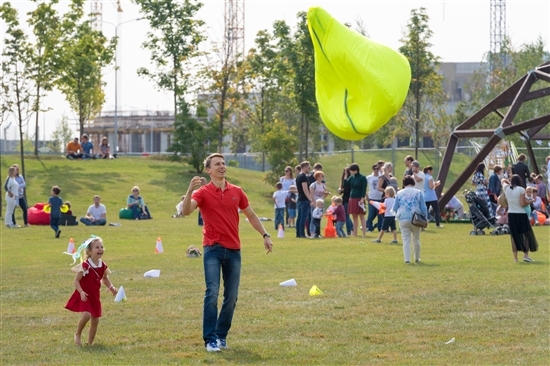 The Skolkovo International Gymnasium marked September 1 with outdoor fun and games. Photo: Sk.ru. This year, the Skolkovo International Gymnasium, which is open to children aged from two to 18, plans to launch several programmes to support gifted children, using the resources available to it as a key element of the innovations ecosystem. “These programmes are related to engineering, biotechnologies and medicine, space and maths, and are aimed at children who want to deepen their knowledge of these areas,” says Demianenko. “We are really counting on our colleagues from the Skolkovo Institute of Science and Technology (Skoltech) to help us with this project, since they have all the conditions in place to do so,” she said. Skoltech, a graduate research university set up in cooperation with Massachusetts Institute of Technology, is preparing to open its own brand new campus in the coming days. 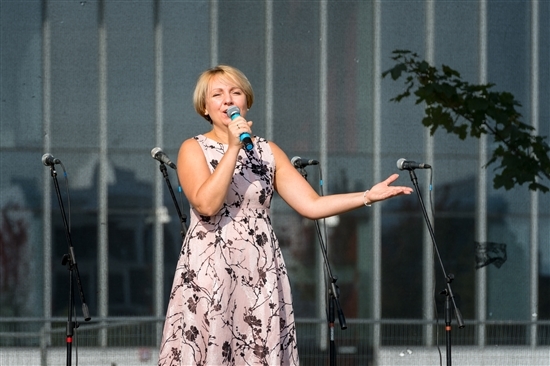 Gymnasium director Oksana Demianenko welcoming students to the school on September 1. Photo: Sk.ru. The gymnasium will also this year see its first class studying for an International Baccalaureate (IB) diploma complete their school studies. The school obtained IB accreditation for all three age groups (Primary Years, Middle Years and Diploma Programme) during the last year, though Demianenko is quick to point out that right from its establishment, all education methodology at the Skolkovo Gymnasium has been based on IB standards. Of the 10 students who have so far completed their high school education at the gymnasium over the last two academic years, three have gone on to continue their education abroad (in Poland, Finland and Canada), while the others are at prestigious Russian universities, including the Higher School of Economics and First Moscow State Medical University. “They are all like members of the family to us,” says Demianenko of the school’s pioneering alumni. The children sang songs at the event, which was designed for the whole family to attend. Photo: Sk.ru. This year, the school welcomed a total of 560 students: 222 more than last year, when the student body more than doubled from the previous year. Since the last school year, the school has been open to children unconnected to the Skolkovo innovation city, but Demianenko says that about 70 percent of pupils are still the children or grandchildren of either Skolkovo startup entrepreneurs, Skolkovo Foundation or partner company employees or Skoltech staff. This figures attests to the fact that “the gymnasium is one of the main elements of the Skolkovo ecosystem,” says Demianenko. This summer, the school selected new students from among about 1,000 applications, most of which were for the gymnasium’s kindergarten and primary school. The gymnasium is likely to accept more children over the course of the school year, as there are still some free places in some classes, says its director. “There are a lot of young people with small children living and working in the innovation city, so interest was highest in the pre-school section of the gymnasium and for junior school,” said Demianenko. The entrance procedure consists of three written tests in English, maths and Russian, plus a motivational essay for older children and interviews. Those applying to enter IB classes are interviewed in English. 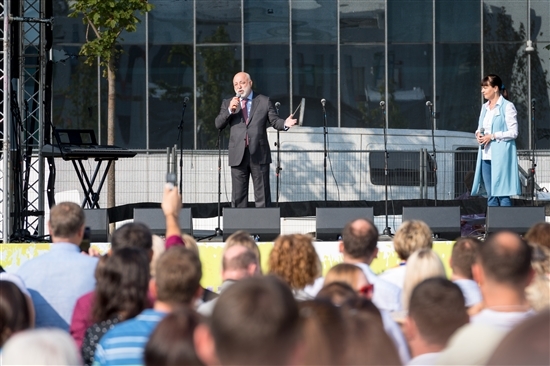 Skolkovo Foundation president Victor Vekselberg welcomed students and parents. Photo: Sk.ru. “As well as academic success, it’s no less important to us how interested the child is in developing, how they see their educational path, their surroundings, their dream and themselves in the future. We ask them to talk about all of this in their motivational essay,” says Demianenko. All the applicants met with both teachers and psychologists. “We have experience and understanding of which children will find it interesting to study here and will be comfortable doing so, and who will find it more difficult and stressful, including due to a lack of motivation,” says the director, explaining what the gymnasium is looking for in its students. Older students in particular can “get something they cannot get at other schools: our ecosystem, our joint projects and cooperation with Skoltech, the material and technical resources and opportunities of our hub, the Technopark, where our students sometimes go … and the overall atmosphere and environment here, which the older students soak up with an understanding of how that might serve them, with a dose of adult motivation,” she says. This year, the gymnasium has 560 students: 222 more than last year. Photo: Sk.ru. As the gymnasium enters its third year, its leadership is consciously thinking about what direction to take moving forward, and what the concept of the school should be at a time when educational standards and thinking are changing every day. “Three years have passed since the gymnasium opened, and many tasks have already been solved: the number of students is growing with each year, we have become a fully-fledged International Baccalaureate school – but what next?” says Demianenko. L-R: Skolkovo Foundation council co-chair Arkady Dvorkovich, Skolkovo vice president Elena Zelentsova and Vasily Belov, CEO of Skolkovo Ventures. Photo: Sk.ru. One of the tasks of the school, particularly given its dynamic growth, is to decide which subjects it will teach to a deeper level, says the director. “And of course, like any other school, we need to instill general humanitarian values in our students,” she adds. One of the channels for gauging the students’ interests is the motivational essays themselves. “It [writing the essay] is a very interesting experience not only for the child … but for us as teachers,” admits Demianenko. 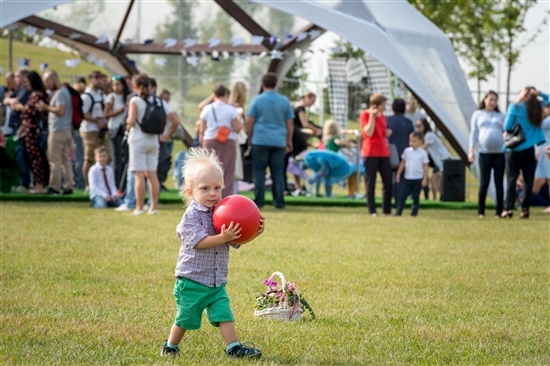 The Skolkovo International Gymnasium accepts children aged two to 18. Photo: Sk.ru. The essays revealed that most prospective students are interested in robotics, technology and life sciences. But the gymnasium’s director is keen to emphasise that the school welcomes children focused on arts and humanities just as warmly. “As we had imagined, the expectations of candidates applying to us were connected to the overall image of Skolkovo as a centre of science and technology,” says Demianenko. Another of the school’s humanitarian strengths is foreign languages: the gymnasium employs 10 native English-speakers, who teach subjects including politics and history in English, as well as the language itself. The pupils, who include several international students, can also choose between German, Spanish and Chinese.